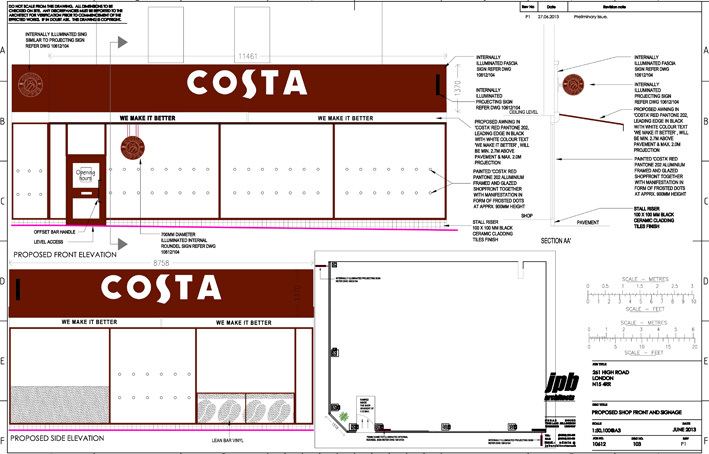 The plans for the Costa shopfront have now been published, at HGY/2013/1319 (illuminated signs) and HGY/2013/1321 (shop front). It looks like a bog-standard aluminium frame design, which is a bit cheap considering this is a conservation area and LBH has done such a good restoration job further north up the High Road in shops of a similar vintage. This was the original target site for Paddy Power, so we can at least be grateful that that was moved round into a smaller site next door on West Green Road. This entry was posted in News, Services, Tradespeople, Shops and tagged costa coffee, everybodies music, planning. Bookmark the permalink. Upper street’s Costa is so much better. Then there is the ones on New Oxford Street and Kingsway. Look on Streetview. Our Council has no concerns or aspirations for our High Rd other than big new bland developments. They are pushing the message that we are so desperate that we will accpet anything and THEY do, although we keep telling them we aspire to better qulaity design. WHY AREN’T THEY LISTENING? Do we have to riot AGAIN!? Costa? In Tottenham? It’d never work. No aluminium frames for Whitstable but ok for us? You mention Upper Street and Oxford Street,but, You need to look at Westminster, Camden and Islington boroughs as a whole.You will find that the new Costa on the High road, is far nicer than many in central London. You are too selective. This is not to say that the ‘best’ designs should not be considered and ‘anything will do’ attitude should be adopted by the council and planners. You think ‘it will never work;. Well, judging by the packed interior and terrace areas – you are clearly wrong. Perhaps you have a preconceived idea, that the people of Tottenham do not deserve this option. Do bare in mind, that less than ten minutes away there is another Costa,which is part of the Tottenham Retail Park. This has been there for a couple of years.Whenever I walk past it – trade appears to be booming. As for my own opinions, I think that there is a tendency for many people to have an attitude that is that any changes are too good for them and that a Costa is only for the posh and that changes will leave them marginalised. I have lived in Tottenham all of my life – nothing is too good for me.I am not saying that I will be rushing out to buy a coffee in Costa,but it happily coexist with existing cafes.If anything, it might influence many shops to aspire to provide services that are of a better standard.